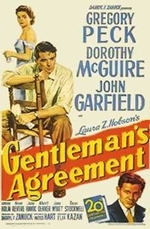 Gentleman's Agreement is a 1947 drama film about a journalist (played by Gregory Peck) who poses as a Jew to research an expose on antisemitism in New York City and the affluent community of Darien, Connecticut. It was nominated for eight Oscars and won three: Best Picture, Best Supporting Actress (Celeste Holm), and Best Director (Elia Kazan). The movie was controversial in its time, as was a similar film on the same subject, Crossfire, which was released the same year (though that film was originally a story about homophobia, later changed to antisemitism). 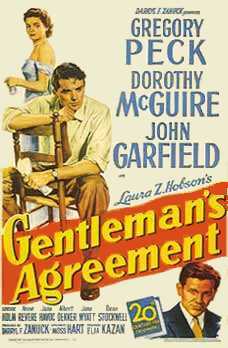 Gentleman's Agreement was based on Laura Z. Hobson's 1947 novel of the same name.